Stuart Broad’s second-best LV= County Championship figures were not enough to prevent Nottinghamshire from slipping to defeat by an innings-and-eight-runs against Yorkshire at Headingley. Broad proved he is ripe and ready for the upcoming Investec Ashes Series, which begins in 14 days time at Cardiff, as he celebrated his 29th birthday with figures of 7-84 against the champions. The right-armer bowled with a skip in his step and venom off the wicket - immediately removing overnight centurions Andrew Gale and Jack Leaning to end their decisive 255-run stand - as he set about confirming the break afforded to him since the New Zealand Test series has refreshed his batteries. Perhaps just as importantly he was also able to bank a valuable 26.4 overs and would have been on a hat-trick in Yorkshire’s second innings had the hosts been required to bat again. When Broad removed last pair Jack Brooks and Ryan Sidebottom with successive deliveries shortly after lunch, Yorkshire were bowled out for 430, a lead of 206 runs. That proved enough for the champions not to bat again - despite a 41-ball Broad half-century - as by the end of the afternoon session, Nottinghamshire had lost seven wickets. The visitors lost their first wicket in the first over of their reply, when Brendan Taylor drove at Sidebottom and got a thick edge to James Middlebrook in the gully. Steven Mullaney was reprieved when shouldering arms to a Brooks no-ball only to then nick Sidebottom before James Taylor was lbw to Steven Patterson for six. Tim Bresnan struck from successive balls, across two overs, when he located Riki Wessels’ edge before getting a favourable lbw decision against Michael Lumb, who was the most assured of the Notts batsmen as he reached 47 with nine fours. Will Gidman worked Brooks off his pads to Gary Ballance at square-leg for a duck and when Alex Lees held a sharp catch high to his left at first slip to dismiss Samit Patel off Sidebottom, Notts went to tea at 108 for seven. Luke Wood was bowled by Sidebottom after tea, but Broad was determined to have some fun before his day was over, crashing Brooks over the leg-side rope on his way to a 41-ball half-century. From the next ball he faced, however, Gale held a superb reflex diving catch at midwicket and then last man Ball skied Middlebrook straight up in the air and Sidebottom held on. 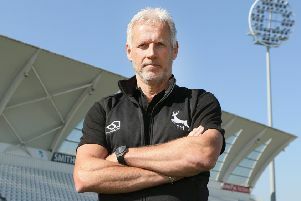 “We were outplayed and I cannot defend out batting today and we didn’t make Yorkshire bowl any magic balls.” said Nottinghamshire Director of Cricket Mick Newell. “I have to accept that we have been outplayed over the three days and in the second innings we showed a lack of technique and there is a lot of work to do as a batting team. “I would like to think our confidence is not too low because we scored 400 in the last match but we have to put more pressure on the opposition. “Both teams would have wanted to bowl first on Day 1 but it says a lot about how Gale and Leaning batted. “We contributed to our own downfall today and I am finding it tough at the moment with the side bottom of the Championship and next to the bottom of the Twenty20 table, but this is as low as it can be and it is up to us to make sure we don’t stay in these positions. “We have two very experienced international bowlers in the side and it would be a cop out to say that we had too many youngsters in the side.